As I type this, I am swilling yet another cocktail, on my hotel room veranda, across from the pool. Enjoying watching holiday makers attempt to covertly remove their wedgies before getting out of the water. Kids splashing in the pool and laughing. My kids splashing in the pool and screaming declarations of war at one another. You get the drift - tropical paradise and all that stuff. I know how good I've got it right now. As our trip is almost over, I find myself actually looking forward to going home. Just a little bit. Maybe it's all the down time I've been enjoying that's afforded me time to think and reflect. I just can't help but get a little anxious over the stuff I have been missing back at home, during my month long absence. 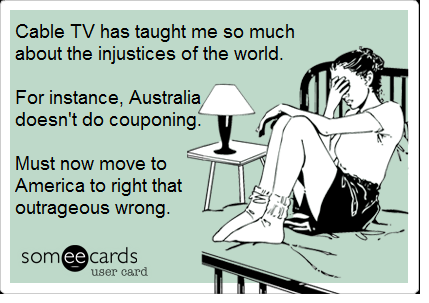 I'm suffering serious withdrawals from Extreme Couponing. I got a tad emotional as I found an old supermarket receipt in my suitcase, and ran my finger down the various specials and savings. Sure I get TV here in Bali. And who doesn't come to Bali to sit in their room and watch TV? But I don't get my shows. So I'm just filling the void with other reality TV crap and the like (Gypsy Sisters, I'm looking at you). I'm now completely invested in their lives, and so I'll have to add them to my viewing list when I get home. But, for now, I'm spending my days trying to figure out the logistics of moving to the USA so that I can become an extreme couponer. Trying to work out how I can sell it to #1Hubby. Apart from the enormous savings potential, seeing us blessed with a 28 year supply of toilet paper and dog food. We don't have a dog, BTW. Stay tuned, and I'm open to suggestions. I'm guessing my ideas will only get bigger and better come Happy Hour! Also, do you think Octomom is a couponer? She'd have to be, right? I wonder if she has a dog? In addition to the 74 children. I think it's more than fair and reasonable to be stressed by neglecting the important things in life. I can hardly cope if my recorder goes on the fritz and I miss an episode of Cake Boss.